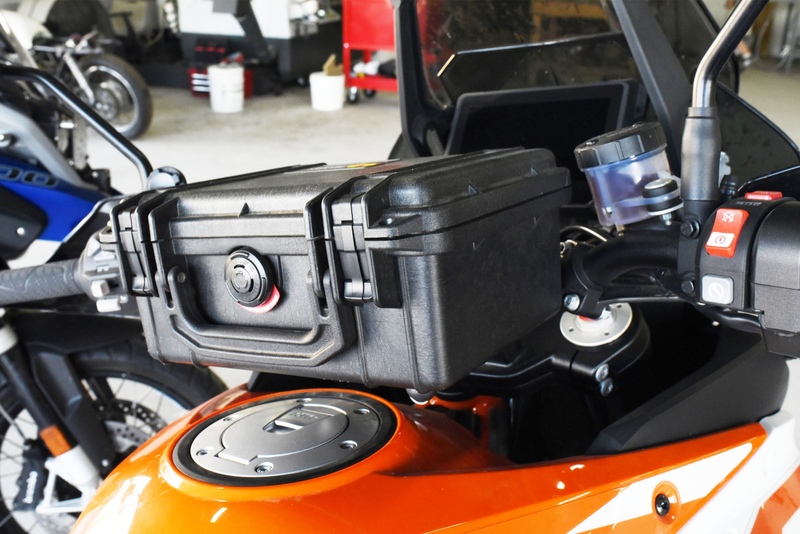 This box will mount to any motorcycle with 1 1/8” handlebars. 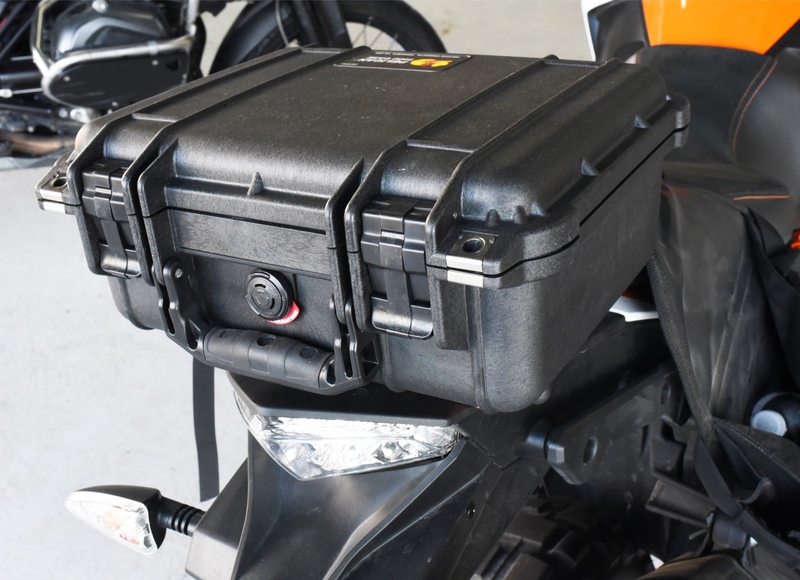 This Pelican 1150 box From Our hard parts company, Fox Hill Moto is made so that you can easily have access to essential items such as your wallet, keys , cellphone, sidearm, toll money, or whatever else you need to get quickly. It also features a quick release mechanism so that you can remove and reattach the box with only a few movements. To remove it you need to pull the pin and twist the hook and then pull back and lift and its off. We have used this box extensively and i can tell you that none of us would leave home with out it. 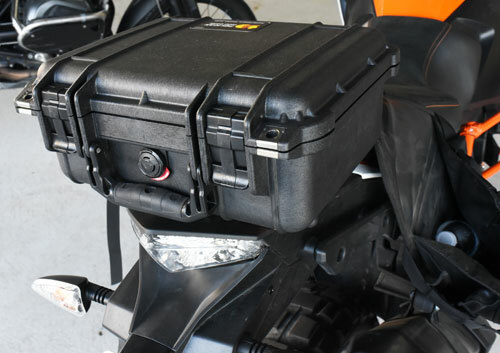 Unlike conventional tank bags and zipper style handlebar bags you can access it easily, and remove it easily as well, with out the use of a fiddly zipper or some kind of strap. 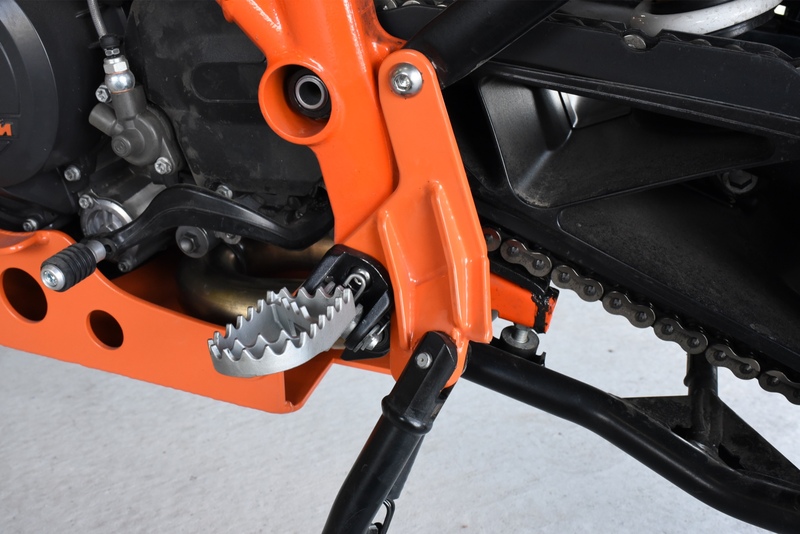 it is mounted with a clamp around the handlebar and then tightened with two hex head bolts. 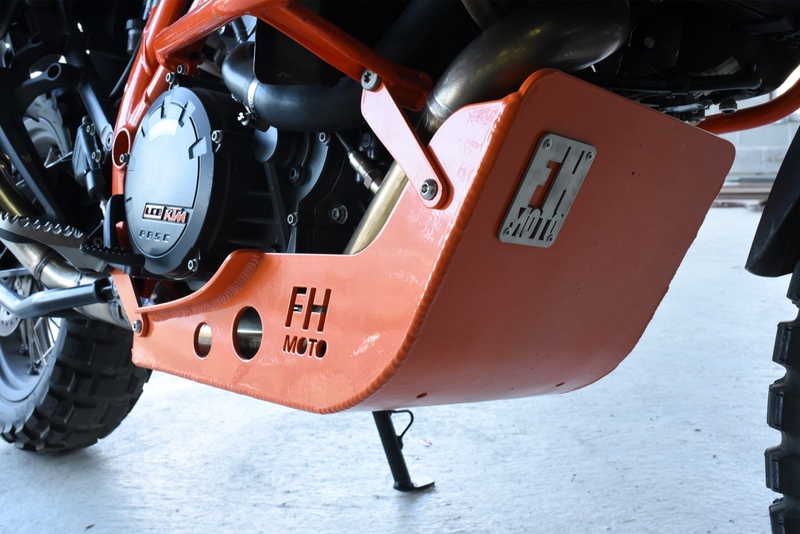 the handlebar bracket stays attached to the bike and you can just remove the box when camping or going in for the night with out the use of any tools. 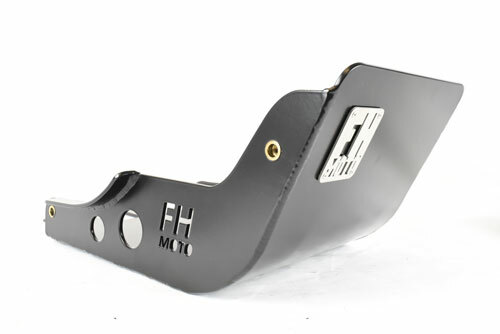 it also features a slot so that you can padlock it so no one can take off with it. 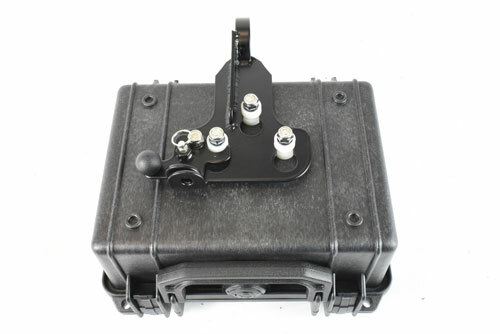 Of coarse the Pelican case can also be padlocked. 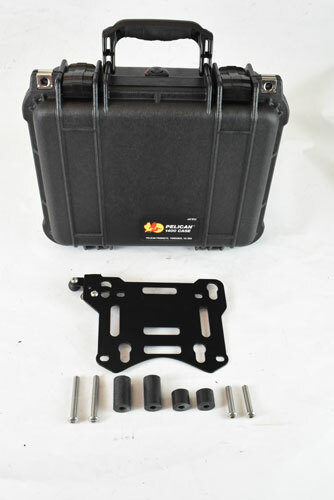 Pelican cases also carry a liftime warrany fro breakage or damage of any kind. 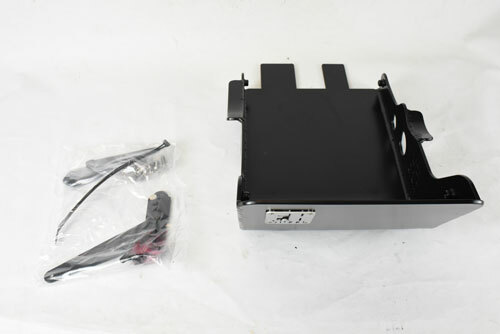 All Hardware and mounting brackets are included with the box. 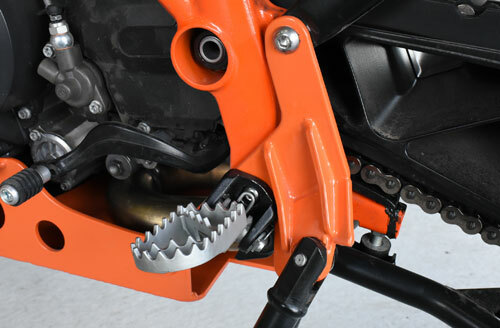 Designed specifically for the 2013 and up KTM 1190,1090, and 1290 adventure models. 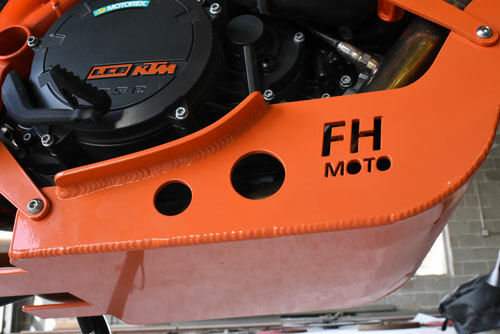 The bracket is made of 12 gauge cold rolled steal that is powder coated in either black or orange to accent your bike. The bracket itself is actually lighter than the factory aluminum rack. 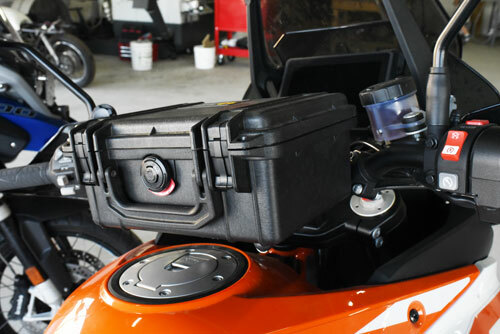 This Pelican 1400 box From Our hard parts company, Fox Hill Moto is made so that you can easily have access to essential items such as your wallet, keys , cellphone, sidearm, toll money, or whatever else you need to get quickly. It also features a quick release mechanism so that you can remove and reattach the box with only a few movements. To remove it you need to pull the pin and twist the hook and then pull back and lift and its off. We have used this box extensively and i can tell you that none of us would leave home with out it. 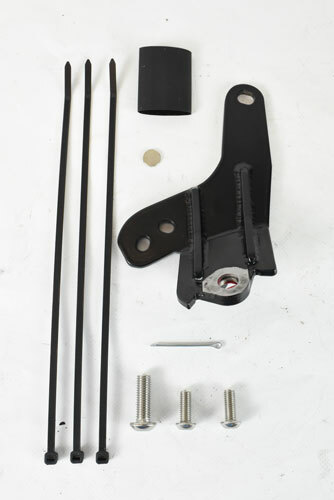 Included in the kit is the bracket that bolts to the rear of your bike where that factory rear rack and grab handles are located. you can retain the grab handles if you so desire. It also features a slot so that you can padlock it so no one can take off with it. 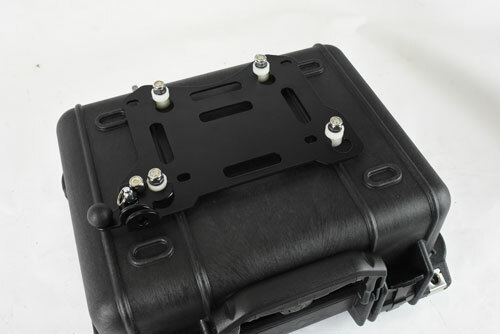 Of coarse the Pelican case can also be padlocked. 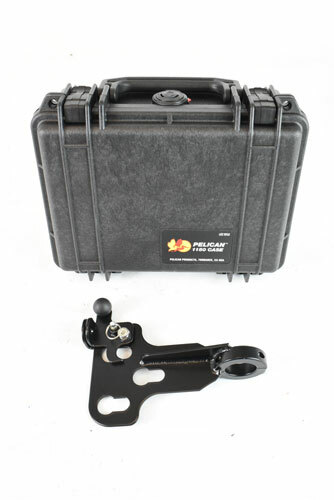 Pelican cases also carry a lifetime warranty from breakage or damage of any kind. 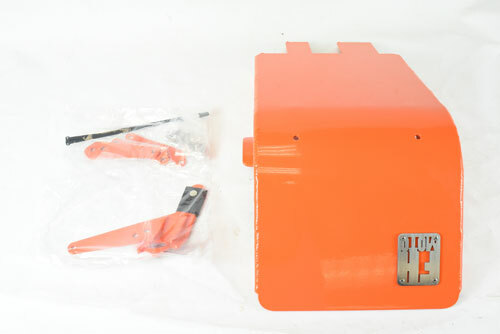 All Hardware and mounting brackets are included with the box.